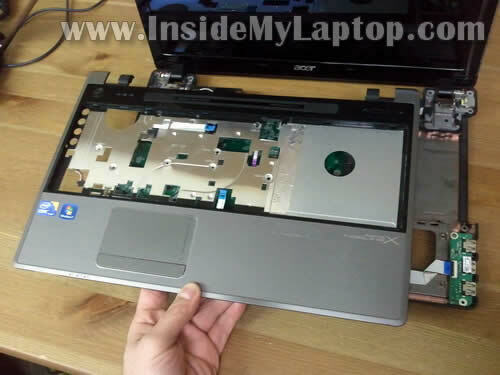 In this post I explain how to take apart an Acer Aspire 5820T series laptop. I will take it apart down to the motherboard. STEP 1-5: Accessing both memory modules, hard drive, DVD drive. STEP 13-18: Removing the top cover (palmrest) assembly. STEP 19-23: Removing the motherboard. STEP 24-25: Accessing the cooling fan, CMOS battery and DC power jack harness. 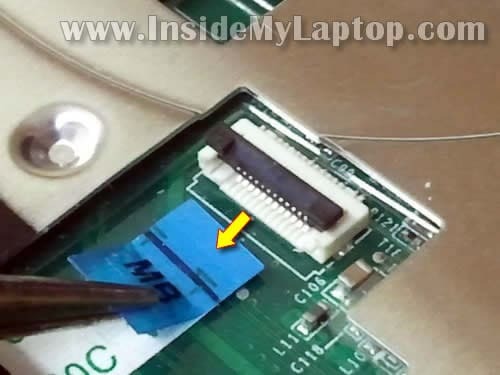 If you would like to replace the LCD screen, you should check this LCD replacement guide. It should be very similar. Make sure the computer is turned off before you start disassembly. 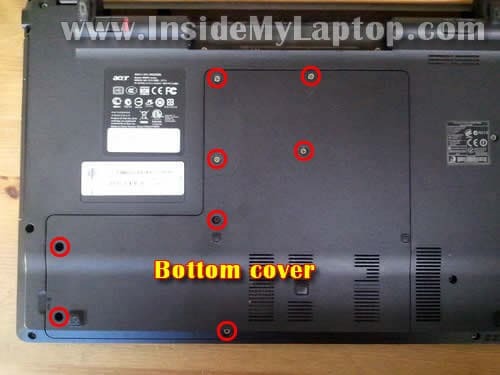 Remove eight screws securing the bottom cover. 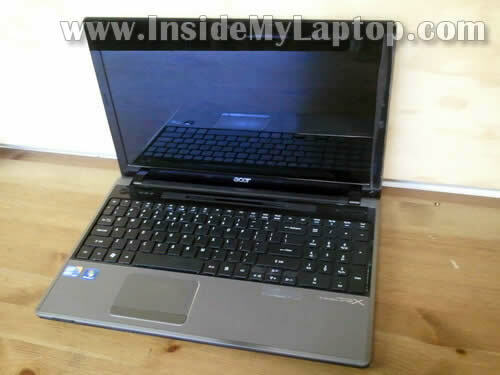 Acer Aspire 5820T can take up to 8GB RAM maximum. You can install up to 4GB RAM module into each slot. 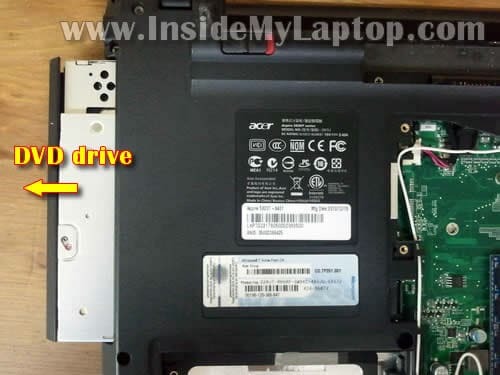 Acer Aspire 5820T has a regular 2.5″ SATA hard drive installed. It can be replaced with any other large capacity 2.5″ SATA hard drive or 2.5″ SATA SSD. 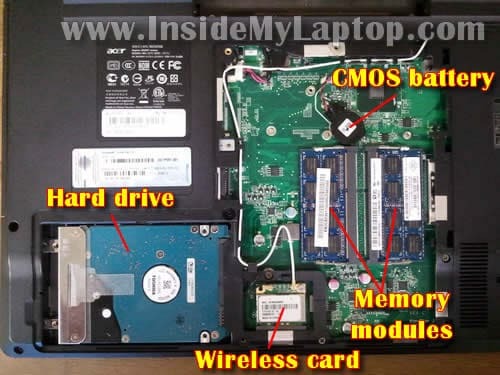 Slide the DVD drive to the left to disconnect it from the motherboard. NOTE: the DVD drive was secured by one of the screws we removed in the step 2. 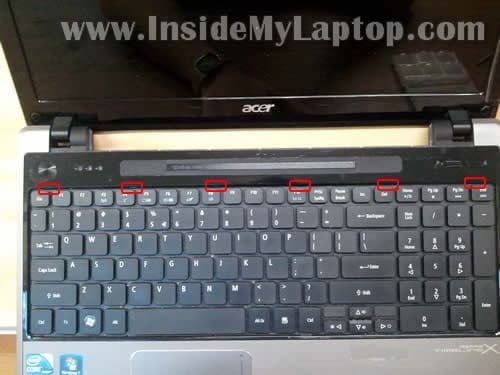 You’ll find six spring loaded locks on the upper side of the keyboard. 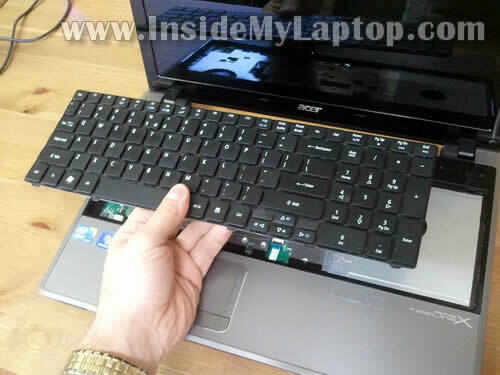 In order to remove the keyboard you’ll have to push all locks into the case and lift up the keyboard. Push one lock into the case with a small flathead screwdriver. At the same time lift up the keyboard a little bit. 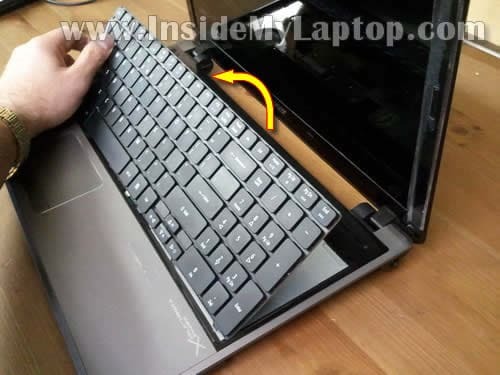 When the keyboard lifted up it will not allow the lock to slide back into the locking position. Do the same with all remaining locks. 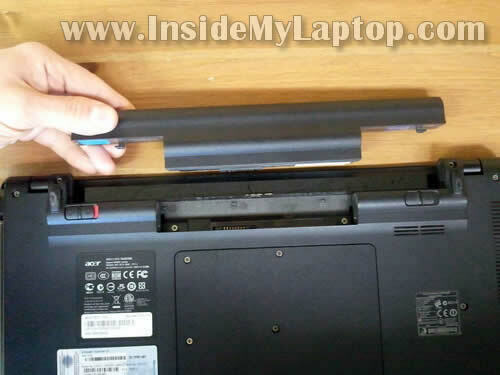 Lift up the upper side of the keyboard and remove it from the laptop base. Be careful. The keyboard still connected to the motherboard. 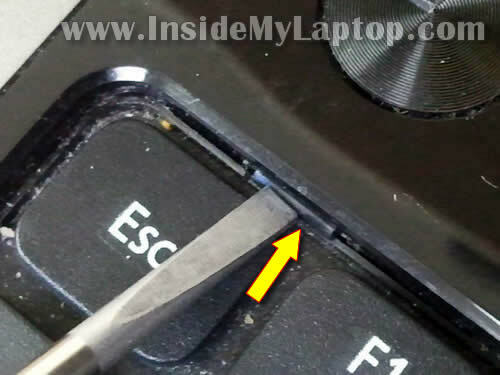 Lift up the brown locking tab with your fingernail. It will open up at a 90 degree angle. The locking clip must stay attached to the white base. 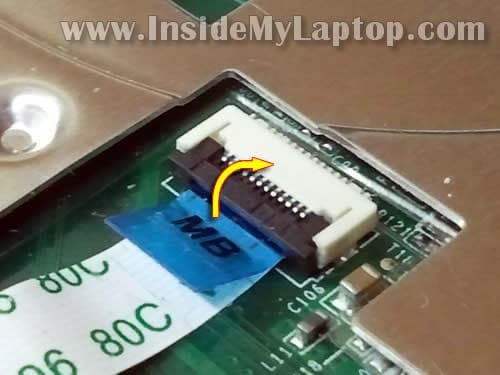 Pull keyboard cable from the connector. Remove all screws securing the top cover assembly. Here’s how to disconnect the speaker cable. It’s a regular male-female type of connector. Simply unplug the male part from the female part. Do not pull by the wires. Disconnect it by the edges of the connector. Disconnect three other cables the same way you disconnected the keyboard cables in steps 10-11. Unlock the connector first by lifting up one side of the locking tab. Stat separating the top cover assembly from the base cover. 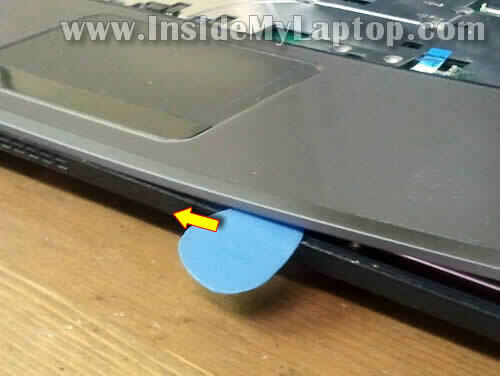 If the top cover doesn’t separate, use a piece of plastic (I’m using a guitar pick). Insert it between the top cover and bottom cover and slowly move along the side. 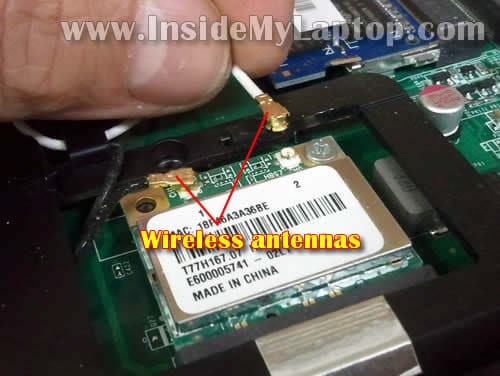 I’ll be removing the motherboard so it’s necessary to disconnect both antenna cables from the wireless card. Also, unplug the DC jack connector from the motherboard. This connector located under the bottom cover which we removed in the step 2. 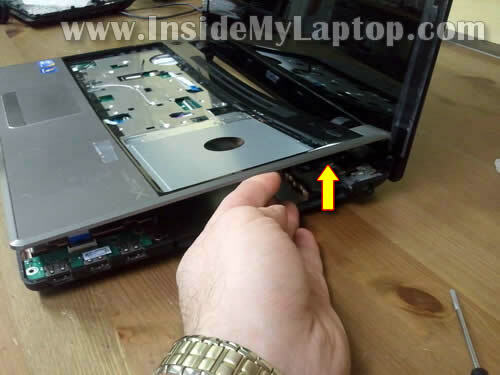 Here’s how you unplug the video cable connector. Just lift it up by the black belt attached to the connector. 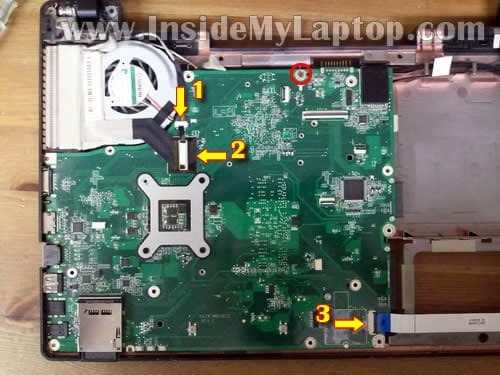 Start removing the motherboard from the base as it shown on the following picture. On the other side of the motherboard you’ll get access to the cooling fan and CMOS battery. 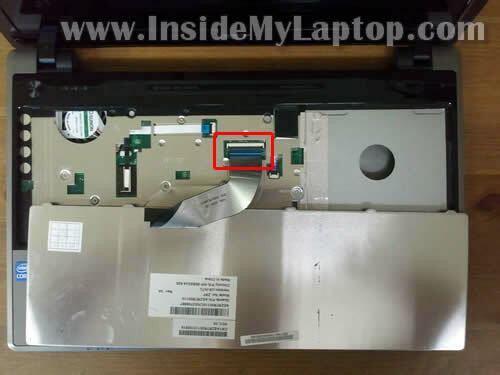 By the way, in Acer Aspire 5820T the CMOS battery IS NOT soldered to the motherboard. It can be unplugged and replaced. The DC jack harness is running under the right hinge mounting bracket. 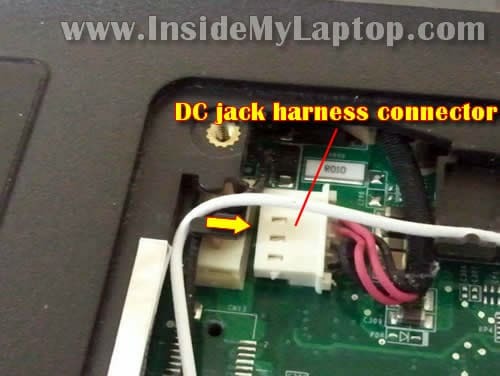 There shouldn’t be a problem to remove the DC jack harness and replace it with a new one if need. 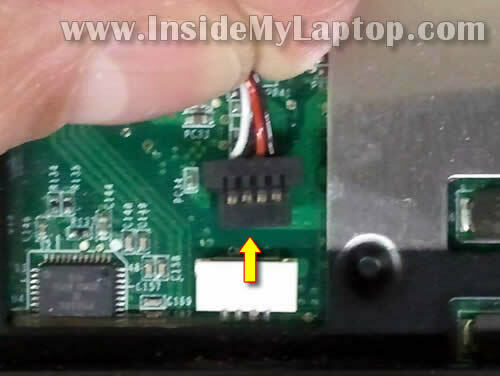 please dissamble dell xps 15 l502x laptop as many of us want to know whats inside such as graphic chips,etc. 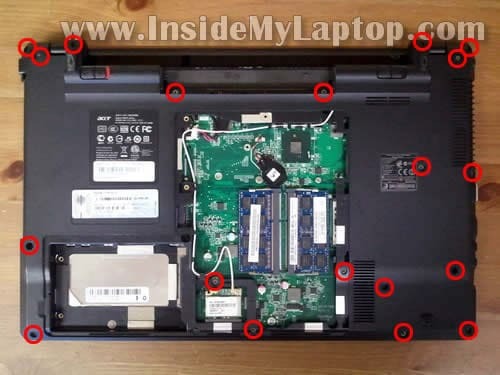 Take a look at this service manual for Dell XPS 15 (L502X) laptop. It has step by step disassembly instructions. Cool, thanks very much! I do have a problem with Acer 5820tg, however. On the keyboard, the letter ‘y’ does not work, thankfully, that was a different layout, so it is basically the letter “z”… any idea on what should I do? I am not sure what would happen in case i would try to rip the key away, would I be able to put it back? Thanks very much. On the keyboard, the letter ‘y’ does not work, thankfully, that was a different layout, so it is basically the letter “z”… any idea on what should I do? If only one key doesn’t work, most likely this is keyboard problem. You’ll have to replace the keyboard. You cannot fix individual keys. Very cool. 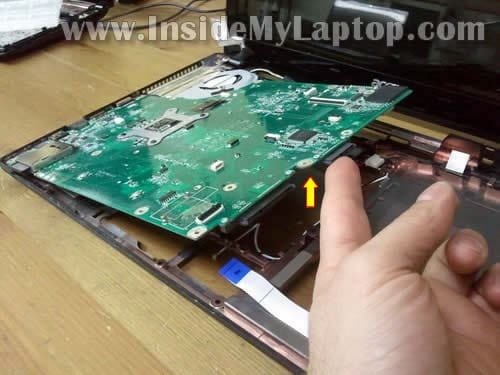 But do you know if I can upgrade the acer 5820T dvd burner to a bluray burner? I know the connectors are the same, but can the bios recognise a different drive properly? 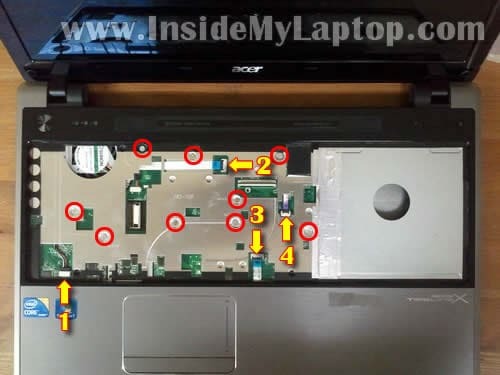 But do you know if I can upgrade the acer 5820T dvd burner to a bluray burner? I know the connectors are the same, but can the bios recognise a different drive properly? Normally DVD drives are configured by the operating system. I’ve never upgraded to a bluray burner myself but I think there shouldn’t be any problem. I assume it has same type of connector as the original drive. I removed both HDD and DVD burner and replaced them both with SSDs. 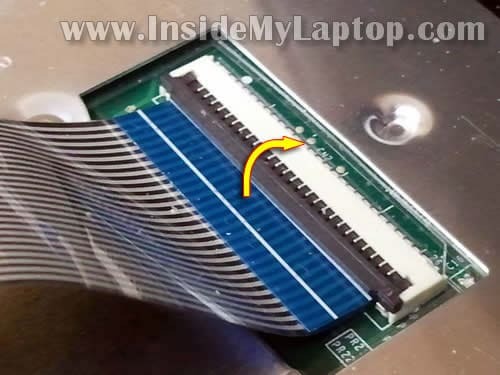 I had to use an adapter in order to attach the SSD in the optical drive slot though (the SSD had standard SATA connectors). I agree with IML Tech, replacing the DVD burner with a Bluray burner should give you no probems. On another note, any ideas on replacing the i5 cpu with a i7? Or would the BIOS refuse to recognize it? i’d like to ask you if some kind of warranty protection is situated on the back cover of this notebook. I still got few warranty months during and i don’t want to lose them. Thank your very much. Thanks a lot. I have cleaned a cooling system precisely and now temperature went down 60 C ! Hello, I did my 1st disassembly before 6 months. I changed the thermal paste and everything was OK. But yesterday I did disassembly again. I removed old thermal paste and also checked fan. I used new thermal paste Coollaboratory Ultra. Everything went OK, new paste was applied so I assembled the notebook. But there’s problem. It won’t start. When I push the ON/OFF button It goes blue (like normal), and I can hear the HDD and DVD start working. But after 2 seconds everything shuts down. Do you have any ideas? Or I killed motherboard? I’am going to check connects again, but I really don’t know, what’s wrong. Everything went OK, new paste was applied so I assembled the notebook. But there�s problem. It won�t start. When I push the ON/OFF button It goes blue (like normal), and I can hear the HDD and DVD start working. But after 2 seconds everything shuts down. Do you have any ideas? Or I killed motherboard? I�am going to check connects again, but I really don�t know, what�s wrong. It’s hard to tell what could be wrong without looking at the laptop. Make sure the DC jack harness (step 20) plugged into the motherboard. 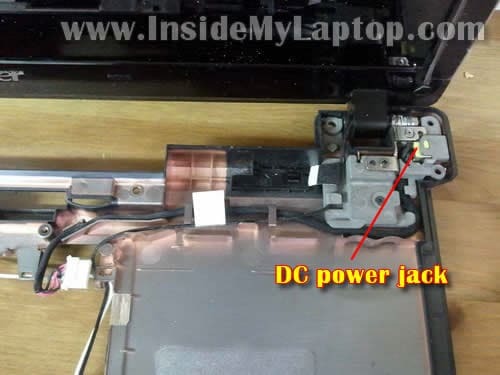 It’s possible the laptop is not getting any power from the AC adapter and the battery is discharged. 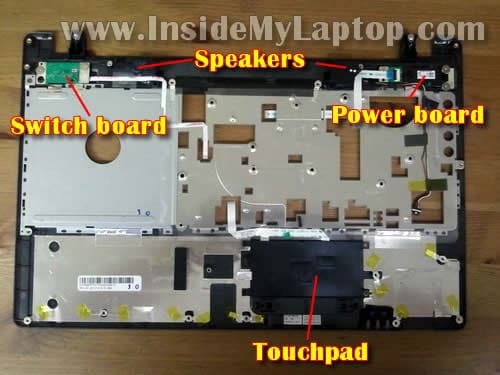 Also, make sure the laptop assembled correctly and the motherboard seated properly. Great instructions man, I’m so thankful! Been having This problem With overheating lately so I decided to give it a go and try to clean up the interiors. Never done anything like this before but I found it easy with this good guidance. Great article, thanks a lot. I just have one problem. I’m at my wit’s end and would appreciate any help. Awesome guide! Easy to follow. Hi! I’m having a problem with this laptop. the USB-port keeps on disconnecting every 2 minutes, then takes about 3-5 seconds and then its working again. I’ve tried reinstalling the driver and I have also disabled the checkbox which allows the computer too turn of the unit. I’m now considering to open it up to check if the USB ports and the cables connected are as they should be. Does that seem like a wise choice? I’ve never opened up a laptop before and I fear that I might do more harm than good. You can try booting up the laptop from a live Linux CD (Ubuntu OS from example) and test USB ports in Linux. If everything works fine in Linux but not in Windows, this could be OS related issue. Try reinstalling Windows OS if that’s the case. 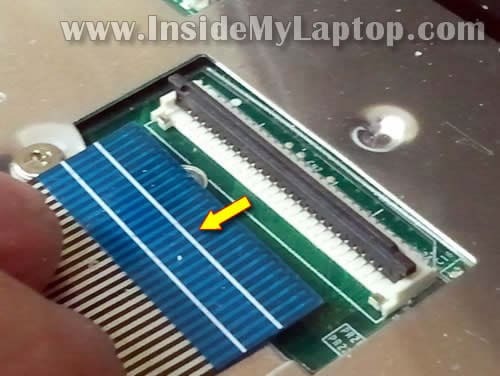 Before you disassemble the laptop you should try to figure out if this is hardware or software related problem. This is my first time trying to disassemble, and I have this issue. After I assemble everything back together, I can turn on (light turns blue and the fan is working) but the monitor shows nothing. Do you know what I might miss. 1. Make sure RAM modules seated correctly. Try reseat them just in case. 2. Make sure the video cable plugged correctly. great and much more useful than any video seen before. Do you mean replacing the LCD screen? Take a look at this guide. I think it’s similar to your model. Can video card be replaced? It seems that Radeon on mine is dead as when I switched to dedicated in bios screen is not turning on. Please advise. I would like to know what kind of ram types are those, beacuse i wanna upgrade mine but i dont know which kind is it !? Thanks in advance ! !